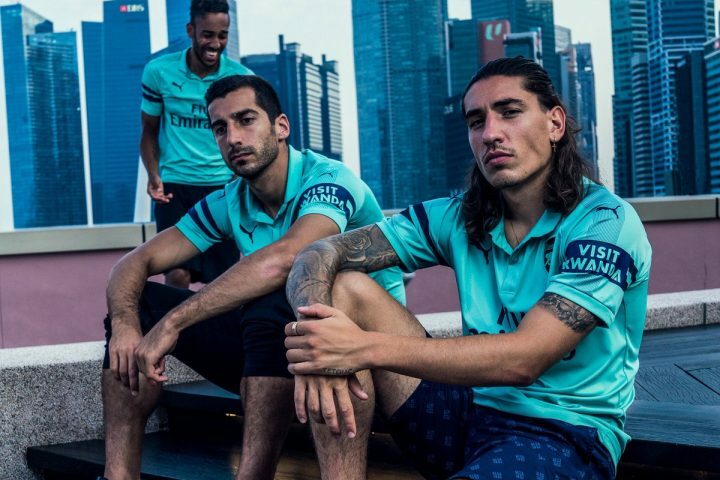 Image from Arsenal kit promo campaign. As the English Premier League returns to the football pitch, Rwanda is also suiting up. Fans can’t help noticing a “Visit Rwanda” logo on the left shoulder of jerseys for Arsenal’s first, U-23 and women’s teams. The deal, inked in May 2018 between Rwanda’s government-operated Development Board (RDB) and the London-based football club, is worth an estimated 30 million pounds over three years. The RDB officials expect that the sponsorship deal will increase the number of foreign tourists visiting the country while also promoting Rwanda as an ideal foreign direct investment (FDI) partner. Critics, including members of Rwanda’s diplomatic corps, questioned the value of deal. Why, they wondered, would a government that receives hundreds of millions of donor dollars every year strike a sponsorship deal with Arsenal? In the wake of the deal, legislators in the Netherlands and the UK demanded that their governments revisit the development aid they send to the country, raising the ire of the senior members of the ruling Rwandan Patriotic Front (RPF). Rwanda, President Paul Kagame chastised, will spend its dollars as it sees fit. He reminded foreign critics to mind their own business. After all, the president continued, “we suffered genocide, you did not.” Since taking power in 1994, the RPF has governed on its terms and conditions, brokering no opposition to its policy choices and remaining allergic to criticism, particularly about human rights abuses at home and abroad. Senior government officials and regime praise-singers predictably defended the Arsenal deal: Those who question the decision are not friends of Rwanda but rather are foes who bark like dogs. Critics, they say, fail to understand the RPF spends foreign aid wisely and well. If foreigners could see how well Rwanda is governed, they would know that the Arsenal deal is a product of commercial diplomacy, intended to reduce Rwanda’s dependency on foreign aid. “Visit Rwanda” branding, they say, just makes good marketing sense to grow tourist numbers and increase revenue. With the horrors of the 1994 genocide a distant memory, Rwanda is focused on economic growth and increasing the flow of foreign tourist dollars is the best way to do so. By August 2018, RDB officials proclaimed the Arsenal deal a promising return on investment, without a shred of evidence. A mirage of economic growth justifies the RPF’s authoritarian rule. The Arsenal sponsorship deal is another example of the RPF’s promoted image of a self-sufficient and peaceful Rwanda, safe and prosperous under Kagame’s capable leadership. It is also emblematic of regime rhetoric that seeks to sanitize the oppressive elements of RPF rule while highlighting government independence from western aid, even as it remains reliant on donor dollars. For many Rwandans, the president is ruthlessly repressive, willing to jail, disappear or assassinate those who question his policy choices or style of governance. The government public relations strategy—whether told in foreign settings or on social media—aims to craft a particular image of Rwanda as a country on the move, fully restored from the violence of the genocide. Among its priorities upon taking power in August 1994, the RPF leadership strategically, and with considerable success, dispatched both the military intelligence services and public relations machinery to craft a singular victor’s narrative of Tutsi victims and Hutu killers. Working with expatriate journalists, aid workers and diplomats—all of whom were rightfully shocked at the human suffering the country experienced—RPF media handlers were able to quickly crafted a singular RPF-produced narrative that framed itself as the hero who saved Rwanda from chauvinist Hutu elites with ethnic hatred in their hearts. Widely accepted in the West, this narrative has provided the government with the moral authority to remake Rwanda in its vision of benevolent leaders governing the largely uneducated and rural masses. The official PR line is that thanks to government-led initiatives to promote national unity, Rwandans now live in harmony. Ethnic labels—of being Hutu, Tutsi or Twa—are a thing of the past, a relic of previous regimes who manipulated ethnicity for their own selfish political goals. With ethnic unity comes economic development. The subtext is also plain: Rwanda is a good place to do business, and welcomes foreign tourists and investment as part of the backbone of government plans to grow the economy. The Arsenal deal is the most recent iteration of this policy goal, offering a tidy convergence of President Kagame’s love of the beautiful game and the desire to transform his Rwanda, whatever the costs to the average citizen. The strategy of economic transformation has been government policy since 2000, when the RPF first announced its plans in the Vision 2020 document. Designed to transform the country into a middle-income, service-based economy, Vision 2020 was a most ambitious plan, especially given Rwanda’s historical reliance on subsistence farming and foreign aid. Undeterred by such realities, the RPF would deliver a median household income target of US$1,240 and a life expectancy of 55 years (up from the 2000 baseline of US$290 and 49 years). By 2016, the impossibility of meeting Vision 2020 goals was clear. Instead of taking a hard look at the structural economic and political limitations of poverty alleviation in landlocked and natural resource-poor Rwanda, the RPF refashioned Vision 2020 as a new and improved economic plan dubbed Vision 2050. The President mapped out his government’s economic agenda for the next 34 years. Kagame promised to make Rwanda an upper middle-income country by 2035 and a high income one by 2050. According to the World Bank, middle-income countries have a gross national income (GNI)) of between US$4,036 and US$12,476; high-income countries have a GNI of more than US$12,476. Raising per capita incomes to these levels will be a difficult, if not impossible, order given that Rwanda’s 2015 GNI was just US$700. Never one to shy away from hard work or worry about the harsh realities of subsistence farmers, Kagame stressed that the 2050 goals will require an average annual growth rate of 10 percent. Reaching this near-unattainable goal will fall on the backs of rural farmers, as local officials do all they can to get as much as they can out of an already exhausted population. Doing more with less is a public virtue in contemporary Rwanda, even as the government stands accused of manipulating poverty-reduction data to rationalize its hard line on economic growth. For the time being, the government seems more interested in producing impressive statistics over investing in a diversified pro-poor economy. Indeed, for all of Kagame’s bluster about FDI and tourism as the basis of Rwanda’s economic transformation, the numbers are far from promising. World Bank data reveals that up to 2017, FDI accounts for approximately 13 percent of Rwanda’s budget, illustrating the need for continued foreign aid receipts. And, despite receiving an increasing number of foreign tourists since 2010, Rwanda attracts fewer than one million per year, raising questions about how the hospitality sector can provide the promised foreign exchange dollars. By the end of 2014, the hotel industry registered only 19 percent occupancy, with 97 percent of beds sold to foreigners. Major hotel chains, such as the Radisson and other luxury names, brought in most foreign business, while local boutique hotels, guesthouses, and hostels in Kigali and the rest of the country often go weeks without selling a room. Rather than address these realities head-on, the government instead brushed off hospitality-sector closures as the result of hoteliers failure to meet strict hygiene standards. Owners in the capital Kigali and elsewhere sang a different tune, citing an absence of skilled tourism professionals, lack of demand and high taxes. Few dare mention that RPF-controlled investment companies own shares in luxury hotel properties marketing Rwanda to foreign tourists and investors. Kagame responded in typical fashion, admonishing those who complain. The president’s message remained on point: Those who cannot keep up the pace of development are quickly reminded of the need for hard work and entrepreneurial spirit to meet government demands. The Arsenal “Visit Rwanda” campaign is yet another example of President Kagame’s grandiose vision for Rwanda, seductively disseminated as good economic stewardship. The sponsorship deal is better read as another example of a dictator who is out-of-touch with local realities, bent on pursuing vanity projects rather than actual development. Rwandans deserve better. Sadly, there is no avenue for recourse given the RPF’s tight political grip.